Nothing can prevent identity theft. 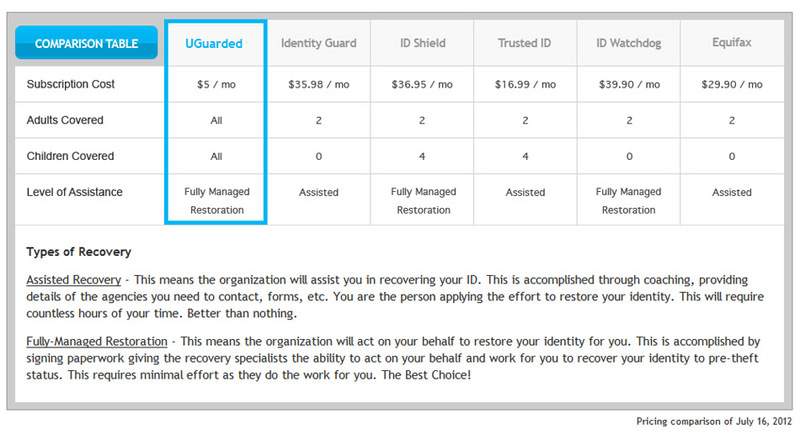 UGuarded provides multi-level protection with ID Monitoring, ID Early Warning Detection, Lost Wallet Service and Fully Managed ID Theft Restoration protection. The whole family is protected from the impact of identity theft. The Internet Monitoring and Surveillance service combines several proprietary automated scanning engines, along with human intelligence gathering and mathematical algorithms to find and analyze data on the Internet that may reveal compromised personal client data. Fraud Expense Reimbursement Master Policy from Travelers Insurance is designed to be purchased by a financial institution, commercial business or membership group in order to provide its customers or members with the coverage at no charge to them. The Lost Wallet Service is a unique, one-of-a-kind service that allows you to store certain information about the contents of your purse and wallet securely online. Without having to store full financial or personal information, the Lost Wallet Service will become a critical piece of your identity theft protection service in the event your wallet or purse is lost or stolen. If your identity is ever assumed by a criminal, we will aid in the recovery process in two ways. We can either completely do it for you (Fully-Managed), or assist you in the resolution process (Assisted) - your choice. If you choose to have us assume and reorganize the recovery process on your behalf, we can further minimize the time and hassle involved. Credit monitoring and identity monitoring are not the same. Both offer protection, however identity monitoring, as UGuarded offers it, is uniquely designed to alert consumers to unauthorized attempts to use their identity in the earliest stages of an identity assumption. UGuarded can keep you safe from even the wiliest of thieves when dealing with financial, criminal or medical identity theft.